2018 APS Awareness Month - APS Foundation of America, Inc.
June is APS AWARENESS MONTH!!! We will be bringing you graphics EACH day of the month to help educate and bring awareness to #Antiphospholipid Syndrome #APS. What do you plan on doing for Awareness Month? #Fundraisers? #Sharing Graphics? #Talking about APS? #Wearing APS Gear? Something else? Please share! Got pictures, share those too!! We would love to see them. Come back tomorrow for a new graphic. 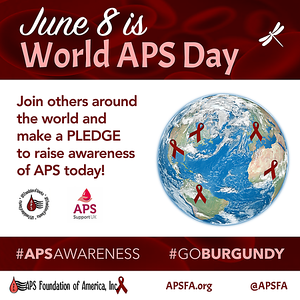 Don't forget the hashtags #APSAWARENESS #GOBURGUNDY #APSFA when sharing. Awareness Month ~ Day 2: How many times have you told someone that you has APS and they don't know what it stands for or what #APS is? Share today's graphic on your wall and help educate your friends and family! For more info: http://www.apsfa.org/ Come back tomorrow for a new graphic. 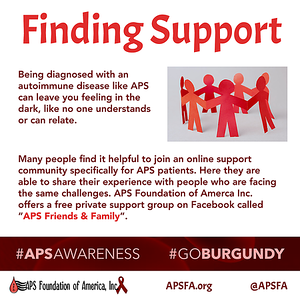 Don't forget the hashtags #APSAWARENESS #GOBURGUNDY #APSFA when sharing. APS Awareness Month ~ Day 3: Today we bring you the clinical features of #APS. Have you experienced any of the symptoms listed? Come back tomorrow for a new graphic. Don't forget the hashtags #APSAWARENESS #GOBURGUNDY #APSFA when sharing. APS Awareness Month ~ Day 4: There are three blood tests that are used to diagnosis #APS. Do you know what they are? You do now! Come back tomorrow for a super special graphic!! Come back tomorrow for a new graphic. 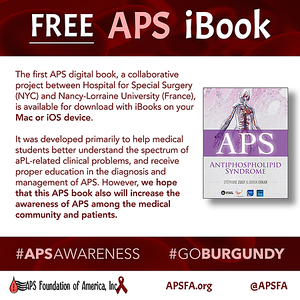 Don't forget the hashtags #APSAWARENESS #GOBURGUNDY #APSFA when sharing. APS Awareness Month ~ Day 5: Whether you are a newly diagnosed APS patient or not, you will likely have felt overwhelmed, like no one understands. You may find comfort in joining an online #support community where you can connect with other #APS patients and share your experiences. You will find that you are not alone. We offer a closed support group on Facebook. the link is: http://www.facebook.com/groups/APSFriendsandFamily/ Please join us for your support needs!! Come back tomorrow for a new graphic. Don't forget the hashtags #APSAWARENESS #GOBURGUNDY #APSFA when sharing. APS Awareness Month ~ Day 6: Do you know the history of APS? When, how, and who discovered it? Bet the story is different than you think it is. The history of #APS goes all the way back to the early 1900's! Check out this article for the story of APS: http://www.jrheum.org/content/30/9/1893.full.pdf Come back tomorrow for a new graphic. Don't forget the hashtags #APSAWARENESS #GOBURGUNDY #APSFA when sharing. APS Awareness Month ~ Day 7: If you've ever been wondering why the dragonfly was chosen as the official symbol (or #mascot) of #APS, today's graphic will explain! The #dragonfly, although delicate looking, is strong and fast. It represents living in the moment and living every day to its fullest. We believe this is the PERFECT symbol to represent APS patients!! What do you think? Come back tomorrow for a new graphic. 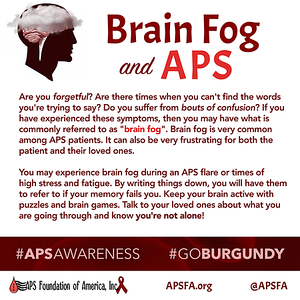 Don't forget the hashtags #APSAWARENESS #GOBURGUNDY #APSFA when sharing. APS Awareness Month ~ Day 9: Pregnancy and APS. 🤰 Unfortunately, #APS can cause #miscarriages, #stillbirth, and blood clots while pregnant and up to 6 weeks #postpartum. However, it is possible to have a successful #pregnancy! Please feel free to share your stories in the comments. Come back tomorrow for a new graphic. Don't forget the hashtags #APSAWARENESS #GOBURGUNDY #APSFA when sharing. APS Awareness Month ~ Day 10: Today our subject is BRAIN FOG. Who suffers from bouts of brain fog? Does it come and go, or is it constant? Did you know this is something that many #APS patients deal with? How do you cope when your head is feeling foggy? Comment below with your tips and tricks to getting out of the fog! 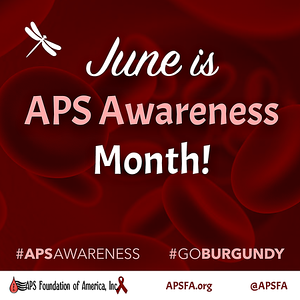 Don't forget the hashtags #APSAWARENESS #GOBURGUNDY #APSFA when sharing. APS Awareness Month ~ Day 11: Today's message is a simple one. #APS and #Lupus are sometimes referred to as "sister" diseases. 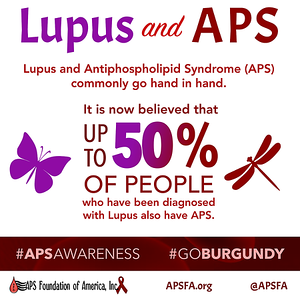 Up to 50% of people who have Lupus are also believed to have APS. Are you one of them? 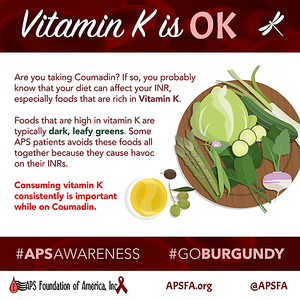 Don't forget the hashtags #APSAWARENESS #GOBURGUNDY #APSFA when sharing. It's really helping to get the word out and is great to see people working together globally to bring awareness to APS! 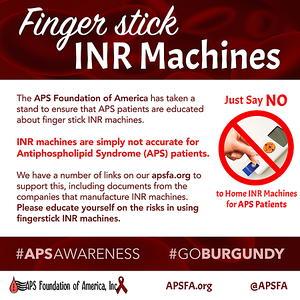 APS Awareness Month ~ Day 12: FINGER STICK INR MACHINES do NOT work for APS patients!! They are NOT accurate. For more information, PLEASE see our website: http://apsfa.org/inr-finger-stick-machines/ If you have a Finger Stick #INR Machine story, please share it below! Education is key! Come back tomorrow for a new graphic. 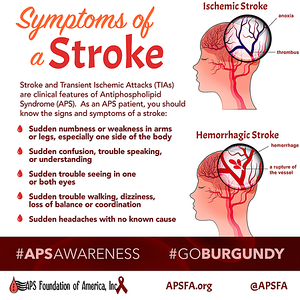 Don't forget the hashtags #APSAWARENESS #GOBURGUNDY #APSFA when sharing. 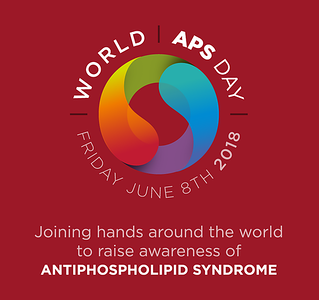 APS Awareness Month ~ Day 14: Catastrophic #Antiphospholipid Syndrome or CAPS is a complication of #APS. CAPS is very rare and in about half of the cases, the APS patient does not survive. Has anyone survived CAPS? Have you lost a loved one due #CAPS? 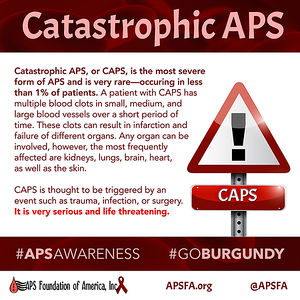 For more information, please click here: http://apsfa.org/caps/ Don't forget the hashtags #APSAWARENESS #GOBURGUNDY #APSFA when sharing. Do You Believe in Our Cause? APS Awareness Month ~ Day 15: For the remainder of JUNE, 50% of your donations to the APS Foundation of America, Inc. will go to APS ACTION. If you don't know what #APS ACTION is, come back June 25th! - hint...they are the researchers working on a CURE! 👍 Information on how to donate: apsfa.org/donate/ We also have a button on our Facebook page that you can use to #donate. Come back tomorrow for a new graphic. 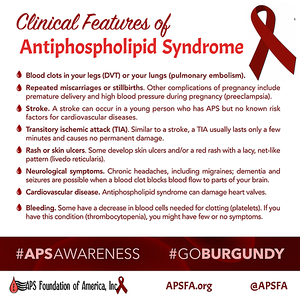 Don't forget the hashtags #APSAWARENESS #GOBURGUNDY #APSFA when sharing. APS Awareness Month ~ Day 16: Today's graphic is pretty simple...it was created to give you an opportunity to share YOUR own PERSONAL #APS story. Tell your friends and family about the disease and how it affects you. This is YOUR time to SHARE. The mic is free and the stage is yours....... Please, also share in the comments below. We may use your story in a future newsletter. Don't forget to come back tomorrow! Don't forget the hashtags #APSAWARENESS #GOBURGUNDY #APSFA when sharing. APS Awareness Month ~ Day 17: Migraines! UGH! Who gets them?? Raise your hand! 🙋 Yep...us too! 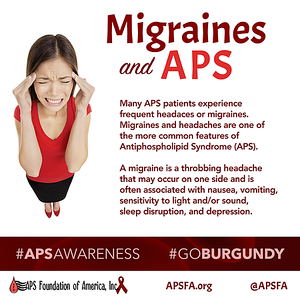 #Migraines are a common feature of #APS. How do you cope with them? Any pointers or tips you'd like to share? Don't forget to come back tomorrow! 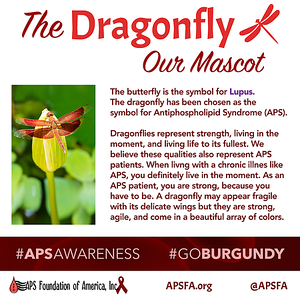 Don't forget the hashtags #APSAWARENESS #GOBURGUNDY #APSFA when sharing. APS Awareness Month ~ Day 18: APS Flares? Did you know there was such a thing? Do you get them? 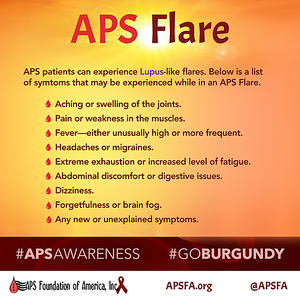 Today we bring you the symptoms of an #APS #Flare! For those who have #Lupus or #Fibromyalgia, you'll notice that these are very similar to a Lupus or Fibromyalgia #flares. Come back tomorrow for a new graphic. 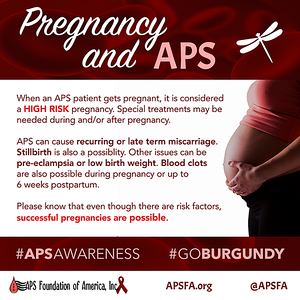 Don't forget the hashtags #APSAWARENESS #GOBURGUNDY #APSFA when sharing. APS Awareness Month ~ Day 19: Deep Vein #Thrombosis or #DVT. How many people have suffered from a DVT? Did you have one prior to or after your #APS diagnosis?? 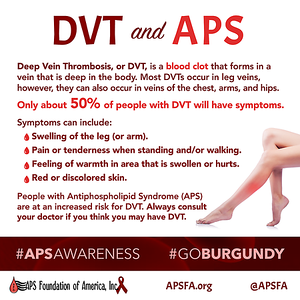 It's important to know the signs and symptoms of a DVT because it is one of the clinical features of APS (#Antiphospholipid Syndrome). Come back tomorrow for another graphic! Don't forget to come back tomorrow! 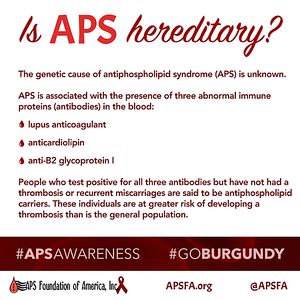 Don't forget the hashtags #APSAWARENESS #GOBURGUNDY #APSFA when sharing. 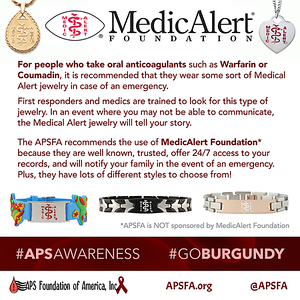 APS Awareness Month ~ Day 20: Do you wear some sort of Medical Alert ID Jewelry? What does it say on it? It is recommended that people who are on anticoagulants such as warfarin wear a medical alert ID. The #APSFA recommends MedicAlert Foundation because they are well known and offer 24/7 access to your medical information. This is important because in the event of an emergency you may not be able to communicate. *not a sponsored post*, we just believe in the products! Please share some comments below about your ID if you wear one. 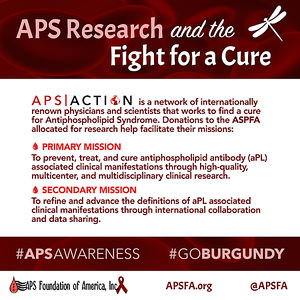 Don't forget the hashtags #APSAWARENESS #GOBURGUNDY #APSFA when sharing. APS Awareness Month ~ Day 21: Everyone, not only #APS patients, should know the symptoms of a heart attack and know that symptoms are different for men and women. Who has suffered from a heart attack? Did you have any of these symptoms? Come back tomorrow for a new graphic. Don't forget the hashtags #APSAWARENESS #GOBURGUNDY #APSFA when sharing. 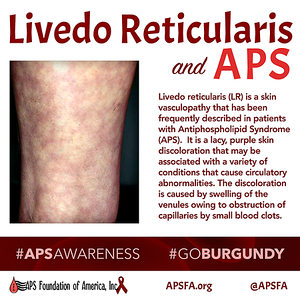 APS Awareness Month ~ Day 22: Another commonality amongst #APS patients is #Livedo Reticularis. This is that netlike discoloration that may appear on your legs or hands (or other areas of the body). Do you have Livedo Reticularis? Share your experience in the comments! A good site for more info is: https://www.medicalnewstoday.com/articles/321422.php Don't forget to come back tomorrow! 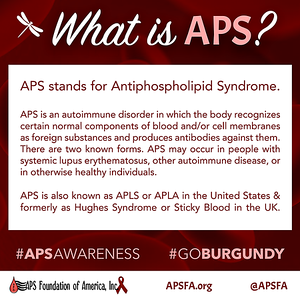 Don't forget the hashtags #APSAWARENESS #GOBURGUNDY #APSFA when sharing. APS Awareness Month ~ Day 23: Today we bring you the symptoms of Stroke. It is very important for #APS patients to know what the symptoms of a #Stroke are because it is one of the clinical features of APS. Have you had a stroke due to APS? Share your story in the comments below! Don't forget to come back tomorrow for another graphic! 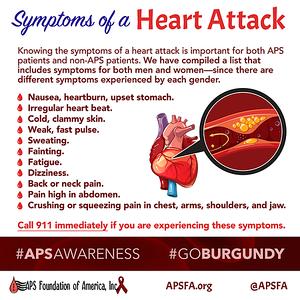 Don't forget the hashtags #APSAWARENESS #GOBURGUNDY #APSFA when sharing. APS Awareness Month ~ Day 24: Many people STILL look at APS as just being a woman's disease. However, #APS does NOT discriminate! Anyone can get APS! That includes men, children, and women of all races, cultures, and religions. Don't forget to come back tomorrow! Come back tomorrow for a new graphic. Don't forget the hashtags #APSAWARENESS #GOBURGUNDY #APSFA when sharing. APS Awareness Month ~ Day 25: Have you heard of APS ACTION?? 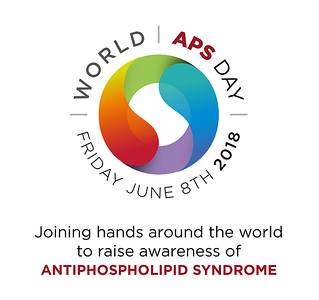 APS ACTION stands for AntiPhospholipid Syndrome Alliance For Clinical Trials and InternatiOnal Networking and they are a team of researchers who are working on finding better TREATMENT and a possible #CURE for #APS! The APS Foundation of America, Inc. believes in APS ACTION's mission and we are one of their sponsors. To learn more about APS ACTION click this link: http://www.apsaction.com/ Don't forget that for the remainder of JUNE, 50% of donations to APSFA will go to APS ACTION! Don't forget the hashtags #APSAWARENESS #GOBURGUNDY #APSFA when sharing. APS Awareness Month ~ Day 26: Are you planning a trip this summer? 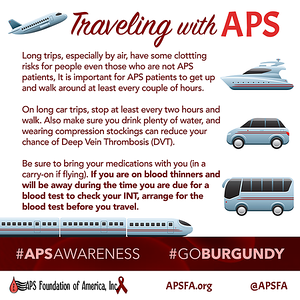 If you have #APS or any clotting disorder, there are certain precautions you should take prior to and while traveling. The last thing you want to do is have to deal with a medical emergency while you are supposed to be enjoying your vacation! If you have other #travel tips to share, please do so in the comments! Don't forget to come back tomorrow! Don't forget the hashtags #APSAWARENESS #GOBURGUNDY #APSFA when sharing. 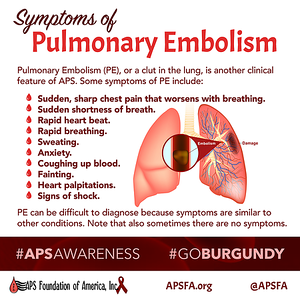 APS Awareness Month ~ Day 27: Today we bring you information about Pulmonary Embolism or PE. As #APS patients, you are at risk for clots, and #PE is a type of clot so it's important to know the symptoms. Have you had a PE before? Care to share? Please do so in the comments below. Come back tomorrow for a new graphic. Don't forget the hashtags #APSAWARENESS #GOBURGUNDY #APSFA when sharing. APS Awareness Month ~ Day 28: The first APS digital book, a collaborative project between Hospital for Special Surgery, New York, NY, USA and Nancy-Lorraine University, Nancy, France, is developed primarily to help medical students better understand the spectrum of aPL-related clinical problems, and receive proper education in the diagnosis and management of APS. However, we hope that this #APS book also will increase the awareness of APS among the medical community and patients. Oh yeah, it's FREE!! https://itunes.apple.com/us/book/antiphospholipid-syndrome/id1185542915?mt=11 Don't forget to come back tomorrow! 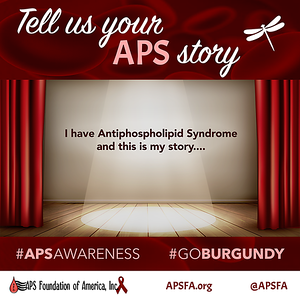 Don't forget the hashtags #APSAWARENESS #GOBURGUNDY #APSFA when sharing.